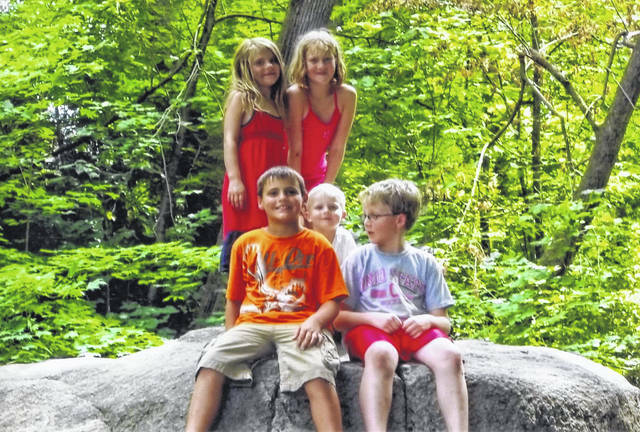 Grandchildren of Yelonda and Larry Fultz, of Botkins, pose in 2011 for the first “cousins photo” atop Big Rock in Sidney’s Tawawa Park. They are, from left, front row, Hunter Fultz, then 9, Bryce Fultz, 4, and Gareth Fultz. Back row, Camille Fultz and Teagen Fultz. Hunter and Teagan are children of Jodi and Choice Fultz, of New Knoxville. Bryce, Gareth and Camille are children of Theresa and Chance Fultz, of Miamisburg. Seven years and several photos later, the Fultz cousins pose in July at Big Rock. They are, from left, Camille, Gareth, Hunter, Teagen and Bryce. On the top of Big Rock in Tawawa Park in Sidney is a shield bearing the names of stone cutters who immortalized themselves there in 1876. Polly and Tom Watkins, both of Sidney, look at Big Rock in Tawawa Park Wednesday, Aug. 15. Editor’s note: This is the ninth in a series of stories to commemorate Tawawa Park, which celebrates its 70th anniversary this year. Today: Big Rock. “We say, ‘Picnic,’ and he says, ‘Big Rock,’” Fultz said. That’s because since Bryce was 4, in 2011, he and his cousins have scrambled to the top of Big Rock for a photo almost every year during the family outing. Arguably the most iconic natural feature of the park, Big Rock is really big. Twelve feet high at its tallest point and weighing in at 103 tons, the granite boulder came to what would be Sidney about 15,000 years ago. It was carried by glacial ice from it’s native land which is about 700 miles to the northeast. According to geologist Albert B. Dickas, its mineral make-up matches that of a massive, 985-million-year-old outcrop of granite in Ontario, Canada. During earth’s most recent ice age, the ice shoved and rolled great masses of earth and stone. Then it receded and left Big Rock as its calling card. 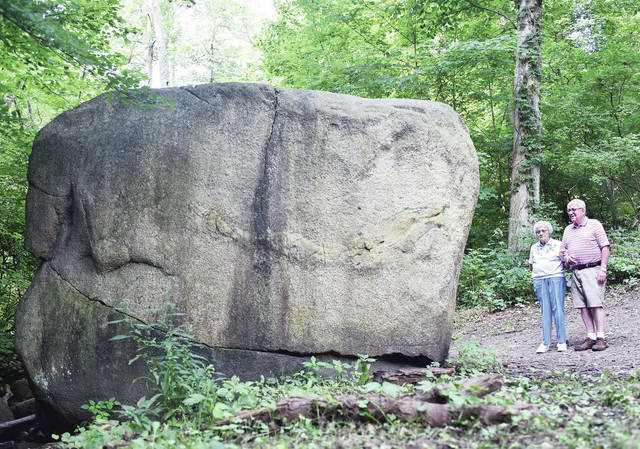 The huge boulder sits along the Ward Trail, at one end of Aschenbach Grove. It has been a favorite place for gatherings of families and friends for centuries. Countless children have climbed on it. Hundreds of would-be brides have said “Yes” to suitors down on one knee in front of it. Thousands of teens have stolen first kisses behind it. No one knows when it got the moniker, “Big Rock,” but that was firmly established as its name as early as 1876, more than 70 years before the park was formed. A Sidney Journal newspaper account in that year refers to Big Rock as it reports on a group of stonecutters who carved the outline of the U.S. national shield into the top of the rock and filled the shield with their names. No one carves the rock today. Duane Gaier, Sidney Parks and Recreation director, said that every now and then, someone will attempt to scratch initials into the surface with a pocket knife. But the etchings don’t last long. Rain and winter weather wipe them away. It’s park staff who have to wipe away painted graffiti. “There are folks that think that putting initials or hearts or dates on it is cute,” he said. “The biggest thing is to get the graffiti off as soon as possible, so no one else gets the idea.” To do that, city works haul a power washer into the park to attack Big Rock, or any other graffitied surface. They also regularly cut back brush to keep trails to the rock open. Recently, they’ve had to remove several dead trees from the natural amphitheater in which Big Rock sits. People, including the Fultzes, appreciate the effort. The annual “cousins photo” has become a tradition. Larry has already told them that they’ll continue to do it until the kids are 21. Hunter, 15, and Teagen, 14, are children of son Choice Fultz and his wife, Jodi. They live in New Knoxville. Camille, 15, Gareth, 16, and Bryce, 11, are children of son Chance Fultz and his wife, Theresa. They live in Miamisburg. “I think family is the most important thing there is. I think it’s important for cousins to get to know one another and be close. Grandchildren are one of God’s greatest gifts. (Taking pictures at Big Rock) is something we can do with grandkids. We’re making memories,” Fultz said. Polly and Tom Watkins, of Sidney, have lots of memories made in Tawawa Park, too. Polly is the daughter of the late Reuben Aschenbach, for whom Aschenbach Grove is named. Tom is the son of the late Cecil Watkins, for whom Watkins Woods, another area of the park, is named. They remember enjoying time in what is now Tawawa even before it became a city park 70 years ago. “We used to live on Court Street, growing up,” Polly said. “Ferdinand Freytag had a hill in his backyard. We used to slide down the hill into the park. I was 6 or 8,” she said. “I used to camp out there before it was a park,” Tom recalled. He and his friends would drag their sleeping bags into the woods for a night under the stars. The Watkinses have participated in a lot of family and church events in the park. Their son, Mark, now lives in Wyoming. “Whenever he comes home, he climbs Big Rock. It’s not a big rock to him. He climbs the Grand Tetons,” Polly said. Both Polly and Tom remember when getting to the top of Big Rock was not something they could do, but neither remembers the first time they made it. How hard it was to go up or down depended on how old the climber was. “It’s harder now,” Tom laughed. “I was probably in high school when I went to the top,” Polly said. “We jumped off,” Tom added. The couple are proud that their parents were involved in developing and supporting Tawawa. They appreciate that their families share in the history of the beloved place and that today, it is well maintained. “It’s a wholesome place to take families,” Tom said. What many people don’t know is that there is another fascinating rock formation in the park. “Hat Rock, the little brother of Big Rock, is on the steep hillside on the north side of Bertsch Hill and is easily seen from Benjamin Trail after the leaves are off (the trees). While I’m not a geologist, I do not believe that Hat Rack is granite like its big brother,” Gaier said. https://www.sidneydailynews.com/wp-content/uploads/sites/47/2018/08/web1_2011-Fultz-big-rock.jpgGrandchildren of Yelonda and Larry Fultz, of Botkins, pose in 2011 for the first “cousins photo” atop Big Rock in Sidney’s Tawawa Park. They are, from left, front row, Hunter Fultz, then 9, Bryce Fultz, 4, and Gareth Fultz. Back row, Camille Fultz and Teagen Fultz. Hunter and Teagan are children of Jodi and Choice Fultz, of New Knoxville. Bryce, Gareth and Camille are children of Theresa and Chance Fultz, of Miamisburg. https://www.sidneydailynews.com/wp-content/uploads/sites/47/2018/08/web1_2018-Fultz-big-rock.jpgSeven years and several photos later, the Fultz cousins pose in July at Big Rock. They are, from left, Camille, Gareth, Hunter, Teagen and Bryce. 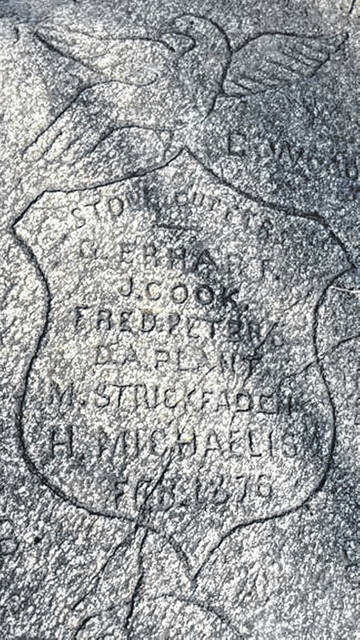 https://www.sidneydailynews.com/wp-content/uploads/sites/47/2018/08/web1_Big-Rock-top.jpgOn the top of Big Rock in Tawawa Park in Sidney is a shield bearing the names of stone cutters who immortalized themselves there in 1876.